Pyrex 7740 is Corning's trade name borosilicate glass. Because of its low coefficient of thermal expansion, the material is useful in high temperature applications, and is also heat shock resistant. 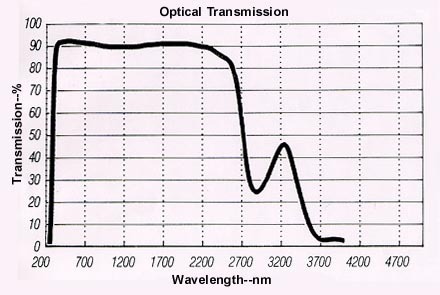 Pyrex is also resistant to acid and has high optical transmission over a wide wavelength range. The low alkali content of Pyrex also makes this glass ideal for high-purity laboratory applications. Pyrex glass can be used as a coatings substrate, and can also be polished by Valley to standard and custom thicknesses. Valley also provides thin polished Pyrex glass wafers. Flexural Strength: 69 MPa @R.T. Thermal Conductivity: 1.1 W/mK @R.T. Specific Heat: 0.18 cal/g-°C @R.T.
Dielectric Constant: E=4.6 1MHz @R.T.
Resistivity: 8 x 1010 ohm/cm @R.T.